Personal property is insurance lingo for “your stuff” (bikes, laptops, TVs, etc.) – it’s also known as Coverage C on renters and homeowners insurance policies. Did you know that renters and homeowners insurance covers the stuff you own (aka, your personal property)? You’d be surprised to hear that a lot of people, especially renters, are unaware of this fact! Personal property coverage, referred to as Coverage C in your insurance policy and also known as contents insurance, applies to you stuff in the event of a covered loss (more on that in a bit). Q: What’s considered personal property, you ask? FYI, personal property coverage is also extended to bad things that may happen (named perils) to the stuff friends and family may temporarily have left at your place. For example, say a burglar broke in and stole your friend’s single speed while you were both out at your local watering hole. Their bike would be considered personal property under your policy when it was stolen, and your insurance policy would cover the loss (if their insurance doesn’t already). 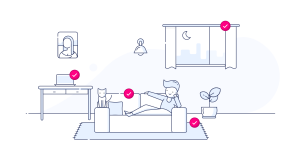 TL;DR: Personal property coverage, part of any standard renters or homeowners insurance policy, helps you recover the cost of your lost or damaged stuff for a bunch of different scenarios, which we’ll dive into in the following sections. Things that wouldn’t fall under the definition of personal property in your insurance policy (even if you own them) are: cars and any other motorized vehicle, animals including birds and fish, and stuff that flies or hovers. Anything owned by landlords, roomers, or boarders also isn’t covered either. Read: that Airbnb’ers stuff that was ruined by a burst pipe? Not covered by your insurance. Your landlord’s couch that came with the place? Not covered either. The walls of your home? That’d be covered, but under dwelling coverage, or the type of coverage protecting the structure of your home. Standard renters and homeowners policies cover named perils – bad things that may happen to your stuff – including fire, lightning, windstorm, hail, smoke, vandalism, theft, freezing, damage from aircraft or vehicles, and riots, to name a few. So, if you’re a renter, and a fire in your kitchen destroys your stuff, or someone breaks in and steals your TV, you’re covered by your personal property coverage. That said, this is a bit different for valuable items (like jewelry, sports equipment, fine art, etc.) since these things usually have sublimits, which means max amount your insurance company will cover you for. Not to worry, though – you can schedule personal property (what we here at Lemonade HQ call adding extra coverage) for the stuff you care about at a relatively small additional cost. Bonus: This stuff will also be covered for accidental damage and mysterious disappearance, insurance deductible free! A friendly tip though… make sure you have all the documents, receipts, police report, and any other info you can get for a swift claims process. For example, if you have $27K worth of items, you should choose a personal property coverage amount of $30K. Basic policies start with $10,000 of personal stuff. Increasing that to $30,000 is usually the smarter (and not too pricey) thing to do. If you need more than that, if you increase now, you’ll pay less later.